Ireland head coach Joe Schmidt said there was a huge amount of positivity from the performance the side had delivered in drawing 16-16 with Wales in Dublin. A draw - the first between Ireland and Wales since 1991 - meant that both sides’ Grand Slam and Triple Crown hopes foundered at the first hurdle, yet they played with such fearsome commitment and intensity to still suggest strong title ambitions. A draw was arguably the fairest result, given that both teams did their utmost to batter each other into submission and neither deserved to taste defeat. It probably means that Eddie Jones’ England are the opening weekend’s winners, yet both Ireland and Wales will move forward in the tournament with confidence on this evidence, both believing that silverware is achievable. Ireland boss Schmidt took heart that his side could still perform, given the absence of nine front-line players. “It’s comforting because you’re not quite how you’re going to go,” said Schmidt. “It is a new level, some of them have dipped their toe in and obviously CJ hadn’t but he acquitted himself so well that he led. “That’s the challenge for those people to come in and step up straightaway because there’s no opportunity, particularly in the Six Nations, to get anything close without being launched into it. “So there’s some encouraging things but the feeling in the changing room afterwards was a little bit deflated and little bit cognisant that we have to go forward, we have to improve further. That’s going to be a challenge because I actually did think we performed really well today. “That first 30 minutes, there’s a lot of times when we have had a really good experienced core available and not put a first 30 minutes together as well as that. On the down side, Ireland do have a number of fresh concerns, with Keith Earls having suffered a suspected concussion which could see him ruled out for the trip to Paris to face France on Saturday. 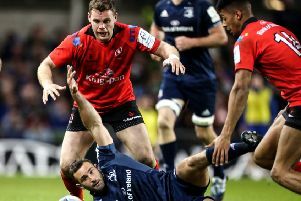 The Munster flyer must now go through the return to play protocols to prove his fitness while flanker Tommy O’Donnell did pass a Head Injury Assessment (HIA), so will be free to return to training. Sexton avoided serious injury in spite of suffering a “sore” bang to his chest, Schmidt confirmed. “Tommy O’Donnell passed his HIA and showed no ill effects,” said Schmidt. “He could have returned to play but by then Rhys Ruddock had slotted in and was comfortable. “So we thought we would leave it at that. “I think Keith has probably suffered a concussion. “He will be considered to have had a concussive impact and that will certainly put him in doubt for next weekend. “Johnny is sore without a doubt, but I was just talking to Jonathan Davies in the corridor and he’s sore too. Ireland boss Schmidt expects to have full-back Rob Kearney and Sean O’Brien available for selection to face France after both Leinster stars missed the Wales draw with hamstring problems. And Schmidt is also hopeful that Mike Ross and Cian Healy could come back into the mix. Meanwhile, captain Rory Best knows the challenge up front against France will be a huge test for the side. “I think probably to start France, it’s one area of their game that, in club rugby and international rugby, that they’re particularly strong,” said the Ulsterman. “There’s probably areas of their scrum are probably quite similar to Wales, they look for angles and they don’t necessarily always want that straight contest. Best admitted, that in spite of being battered and bruised, he had tried to enjoy the past 24 hours as captain. “I think it’s something that you have to try and enjoy, especially that sort of 24 hours or so post the team run through to kick-off. It feels like it drags but when you look back it goes in a flash. The big thing for me was the senior players that we have in the squad and the way we shared that leadership. It takes a little pressure off. “As a forward it was a fairly enjoyable game to be a part of. I think when you come off the pitch in the front five and you’re a bit battered and bruised that’s always a good thing.